Nothing says, ‘Fall’ like pumpkins. 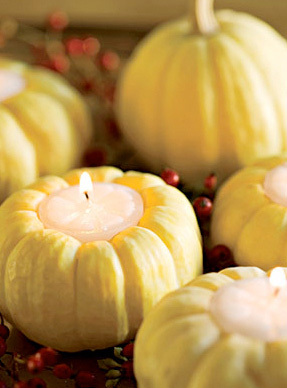 Autumn-inspired décor like pumpkin candles make a great addition to your coffee table or holiday tablescape. Squash can be used as well. Of course, during this time of year, it is easy to walk into any craft store and purchase these candles of various sizes, shapes and colors. However, you can also take on a DIY project and make your own. Don’t worry, it’s simple. Just follow any step-by-step guide on hollowing (removing the flesh) of a pumpkin. 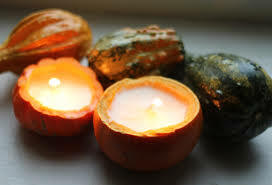 Once the pumpkin (or squash) has been emptied and thoroughly cleaned, place your favorite scented candle on the inside. Many recommend that you soak the pumpkin in water with one teaspoon of bleach per one gallon of water to avoid it from quickly spoiling. You may also want to cover it with a gloss to prevent withering. So let your creativity shine and make custom-made candles that are sure to light up your home with that special touch that only you give!